Spectra Sports Nuclear Reactor Restoration Help! GWTW Forum > Kites! Kites! Kites! > Kite Building and Repair > Spectra Sports Nuclear Reactor Restoration Help! Re: Spectra Sports Nuclear Reactor Restoration Help! Hi Spectra Sport 96, welcome aboard ! I own many Spectra Sport Kites and 3 Nuclear Reactors ! I reframed my 3 Nuclear because all original SkyShark fittings were damaged. No, that's to big for the original SkyShark 7P no tapered tubes of your Nuclear Reactor ! You have to order APA "C". Just put them in boiling water before insert into the leading edges and that will work perfect. No, keep the original SkyShark aluminium ferrule but replace the bad SkyShark Center-T by a vinyl ferrule ! Why don't you keep the original stoppers ? Are they damaged (it happens, I know) ? But I would replace them by cuted vinyl ø 7 mm endcaps. No, to big again. Use APA .250 and boiling water ! Good luck for your reframe of this nice kite (he won the Team WorldCup in Le Touquet - France with Team Tsunami in 1994). I was there ! yep...I can shoot you a private message about them. Can you guys with the Nuclear Reactors or any of the Reactors please post up images of your Center T setups and bridle wraps aound the LE Connectors. Its been a while and I want to make sure i set this up correctly please. Thanks again! I will purchase the APA "C" and the APA .250 connectors to have backup as they are cheap enough. All of the stoppers are gone except two on one LE which seem super soft and ready to fall off if forced. I'll just replace them all with the Molded stoppers as I can glue them onto the LE shafts. I don't understand what you meant by "replace the bad SkyShark Center-T by a vinyl ferrule!" Can you post some images of this setup please? Vinyl Center-T of course, not vinyl ferrule (or R-Sky Center-T if you don't have vinyl T). The way your bridle is attached at the spine and LE looks fine. At the LE I generally put the bridle between the LE fitting and the stopper. Below the LLE fitting and above the ULE fitting. At the spine, keep the bridle below the T and you might want to put a stopper after the bridle to keep it from moving down the spine. This is usually not a big deal. The other reason I wouldn't go back to the external ferrule for my kites is they tend to rub against the sail in storage and leave a wear spot. Probably just me being lazy when I put the kite away. Yes but with an internal ferrule, you have to cut the 2 Lower Spreaders because of the width of the Center-T. If not, you'll not have the same wingspan. I always try too to keep my vintage kites in the configuration of the original kite. Sadly as I tried to find an equal replacement to the original Center T none were found that could accomadate the .300 in. spine and the .380 in. Aluminum Externel Ferrule. I will have to try the Excel Center T I listed earlier in the post or go the route Allen Carter mentioned with the APA Center T, both will require internal carbon ferrule. The Excel Center T option will not require me to cut the Lower Spreader to maintain the same wing span. But take care with the Exel Center in strong winds. Can you increase the diameter of any of these Center-Ts by drilling the hole to a larger spec? Ok for the nuke to fly right you really need as close to the original stuff as possible. My nuke has 5P LE, 5P upper, 7P lower, 7P spine. For the center T I got a piece of delrin rod from tap plastics (you can use lexan rod too) and driled it out to match the ferrule and spine. An APA T will work too if you ferrule the rods. As an alternative to the 7P spreaders you can use skyshark nitro tapered rods. Best place to go for frame advice is to the guy that made them. Jon Trenephols shop is linked on the right. Give him a call over at skyburners shop and he can tell you what will be closest to the 7P and he may even have some old stock around as well. I know me and Allen bought out Steves leftover stock of old rods. Best place to go for frame advice is to the guy that made them. Jon Trenephols shop is linked on the right. Give him a call over at skyburners shop and he can tell you what will be closest to the 7P and he may even have some old stock around as well. I know me and Allen bought out Steves leftover stock of old rods. Well, I called Jon over at Sky Shark / Sky Burner to see if he could give me his best estimate on an 5P equivalent. He asked to call me back, as he needed some time to look through his inventory. He had sounded a bit busy and I didnt want to pressure him so I said "OK thanks Jon, I'll talk with you later." I figured he had been depleted of these tubes for quite a while and would call me back next week or something. He calls me back in like 10 minutes to tell me has one 5P in 32.5in. and in a 36in. He then tells me he would send me the 32.5in. and cut the 36in. down to 32.5in. and cap it as a backup rod for the Upper LE. I couldn't believe my luck and how nice this guy was! The kiting community has not changed at all since I last remebered it in the mid 90's. Glad to be back doing this again! Jon is a great guy. I called him once about an issue that I had with my iNak. Basically, I had lost the battens, but did not realize it. He diagnosed my problem and was kind enough to send me out a replacement set all for free! Super nice guy and a pleasure to talk to. I have two Spectra Sport kites Reactor Pro and one that is larger. I would like to find more information on those kites. I think the larger one is called a Maxi Edge. 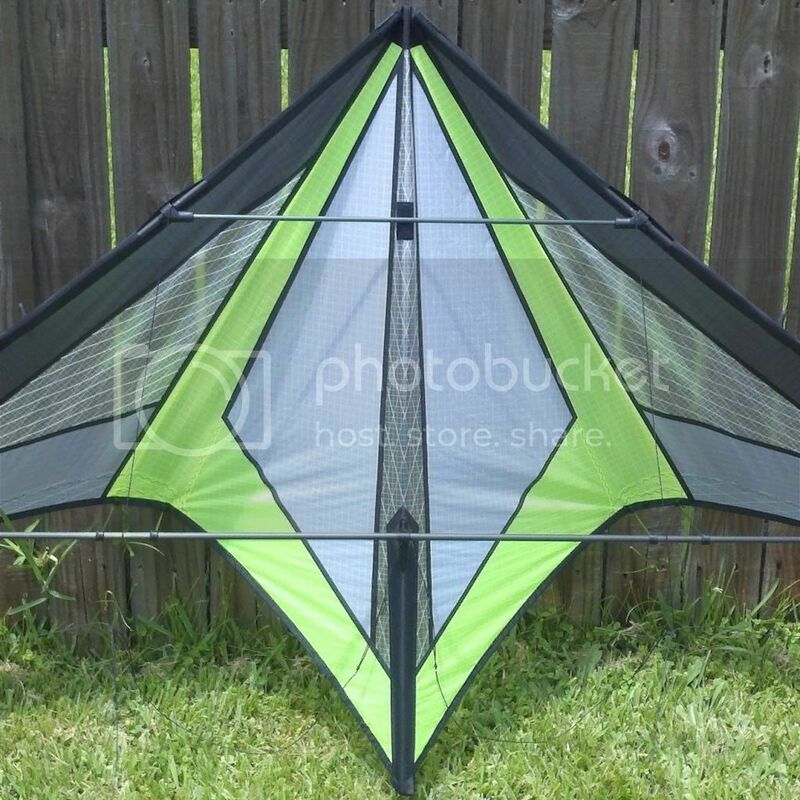 Does anyone know where there is list and set of specs for these kites. I love how they fly. With exception of rotting connectors which have all been replace they are really excellent kites. Love the way they hold a line. The reactor pro is actually trickable with slot machines, fades and axles. The bigger one doesn't like to be knocked out of its flight. Post up some pics when you can. The reactor pro is a fun kite and with a bit of tweaking really trickable.